Store your data on the Canvio® Alumy, and access it quickly and easily through USB3.0. 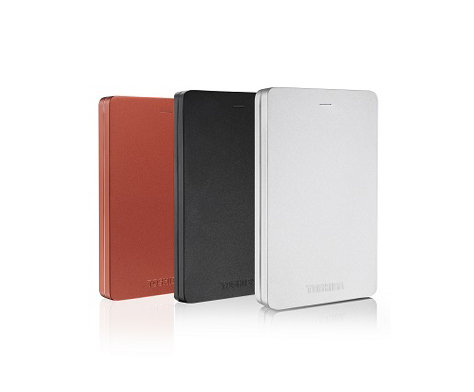 With its elegant aluminum casing, you can look stylish while you’re carrying documents and media files. What’s more, the preloaded NTI backup software allows you to make regular automatic backups of data, for added peace of mind. With a sleek and solid aluminum casing, Canvio® Alumy series portable hard disks not only look stylish, they also feature a built-in shock sensor and ramp loading technology to reduce the possibilities of damages from life's bumps and scrapes. Available in four different colors: silver, black, metallic blue or metallic red, the Canvio® Alumy will always fit the occasion – whatever your style. The black and silver versions are suitable for a sleek, understated look, while the metallic blue and red versions are both vibrant and chic. Back up all your need data and digital memories with NTI Backup Now EZ software1. This easy pre-loaded tool automatically backs up and restores your files or folders – so you can worry less, and create more. What’s more, you can schedule when and how often you want the backups to occur, and even arrange a complete system backup. 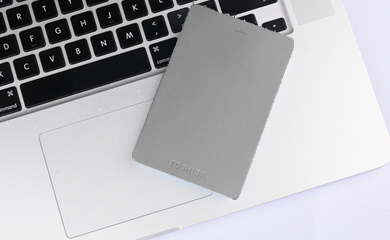 Powered by USB3.0 technology, these portable hard disks are far faster than—but still compatible with—USB2.0 technology. That's important for speedy transfer when organizing your files. 1The preloaded NTI Backup Now EZ™ software is compatible with Windows® OS only.